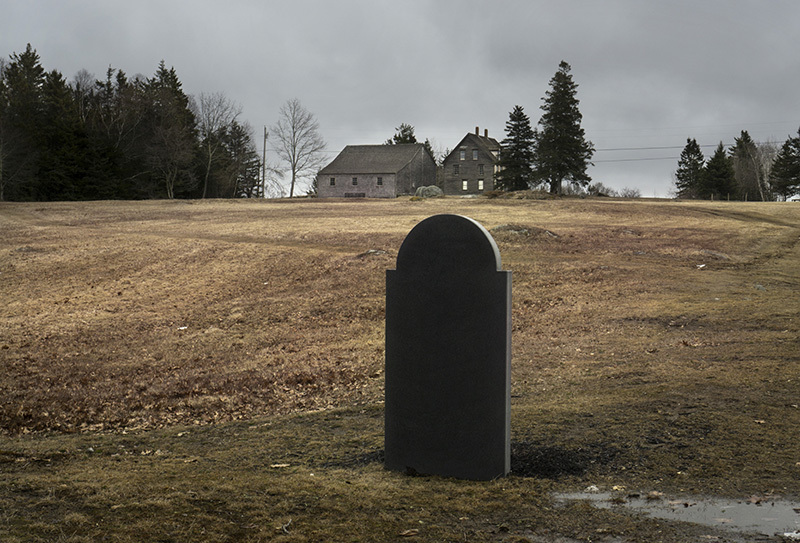 ROCKLAND — The rehabilitation of Andrew Wyeth’s reputation has begun. A complicated man and controversial artist, Wyeth occupies a place of contentious history in American art. 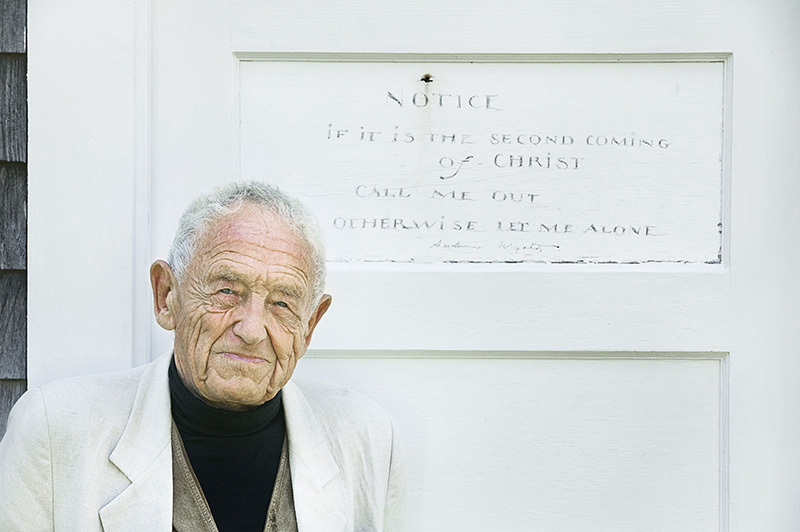 Revered by many for his evocative and mysterious paintings of midcoast Maine and the Brandywine Valley of rural Pennsylvania, Wyeth was, and in some circles still is, dismissed for his sentimental commitment to realism and his conservatism in art and politics during America’s culture wars of the 1960s and 1970s. He was a parochial painter who romanticized rural America, and the critics loathed him for it, using his popularity against him as they contrasted his representational paintings of boats and barns with modern work of the Abstract Expressionists. Eight years after his death and 100 years since his birth, Wyeth is undergoing a critical re-evaluation, and this week the Farnsworth Art Museum in Rockland opens an exhibition of his Maine watercolors, one of five exhibitions about Wyeth at the Farnsworth this year and the latest of many across the country that attempt to reshape the Wyeth narrative with deeper and more thoughtful examinations of his work. 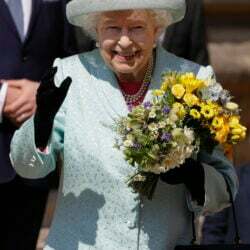 “After I finished ‘Orphan Train,’ I had learned so much about early- to mid-20th century rural life, and was interested in how people survived hard times and the emotional tools they needed to do it,” she said. That led her directly to “Christina’s World” and Wyeth, whose paintings have a populist streak that speaks to those issues with sympathy. 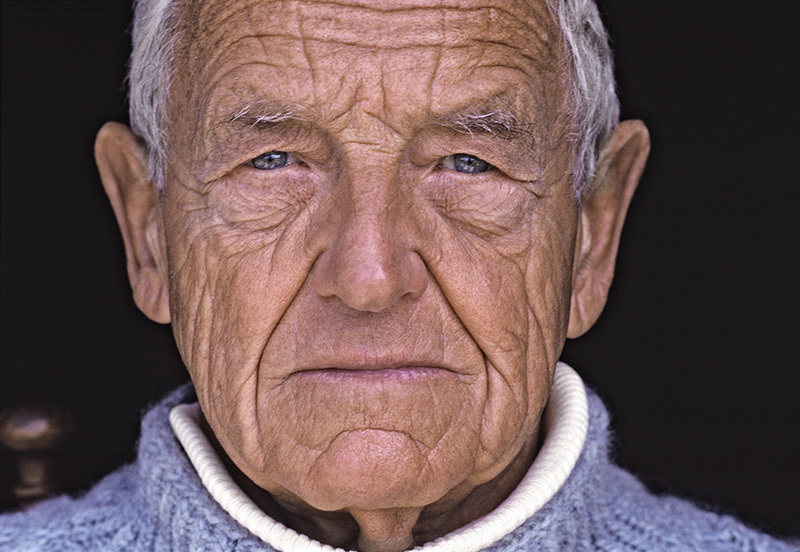 Wyeth had rapport with fishermen and fieldworkers, and class never mattered to him. That gave the public access to Wyeth, even if they didn’t always understand the deeper meanings of his paintings. 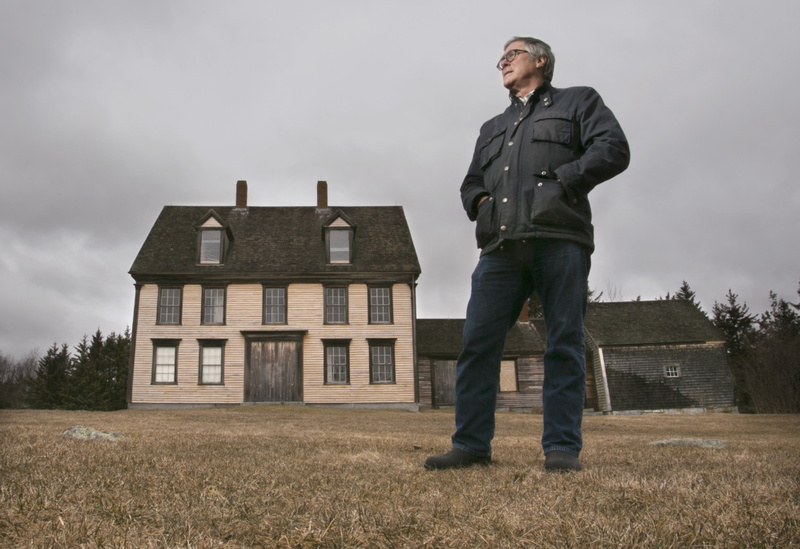 The Wyeths’ presence has loomed in Cushing, Port Clyde and the nearby islands for a century. Family patriarch N.C. Wyeth, an illustrator of national renown, bought a place in Port Clyde in 1920, and the family began coming to Maine in the summer. 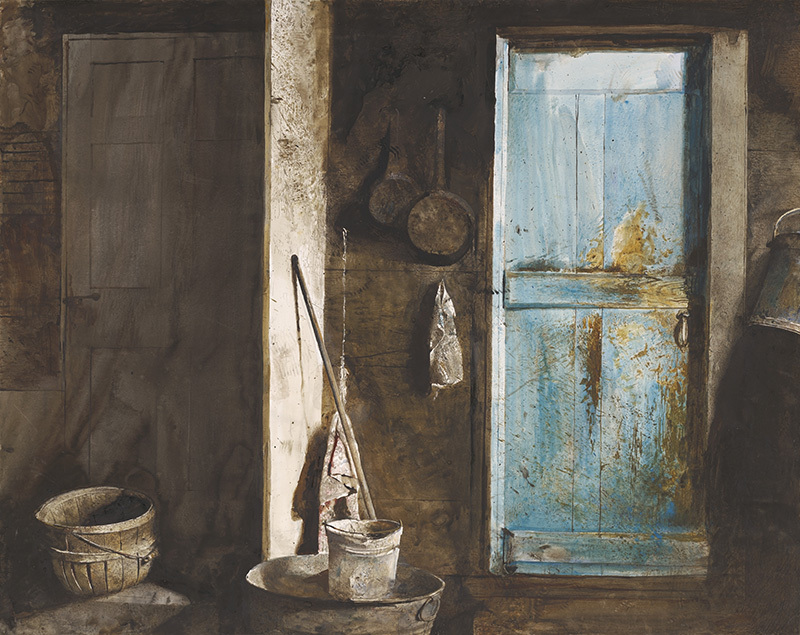 Andrew Wyeth, who was then 3, learned at his father’s side and became successful early in his career with the Maine coast as a primary subject of his oil paintings, temperas and works on paper. The Farnsworth has been closely associated with Wyeth since its inception, and has a long and successful history showing the work of all the Wyeth family. The museum bought its first Wyeth artworks in 1944 – two watercolors and a drawing – and showed those pictures its first summer of operation in 1948. 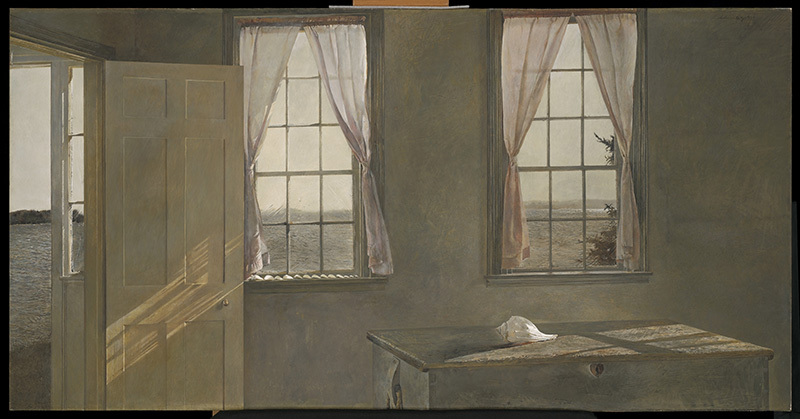 The Farnsworth now owns 36 works by Wyeth, including the 1963 tempera “Her Room,” for which it paid $65,000 in 1964, then the highest sale price recorded for a painting by a living American artist. 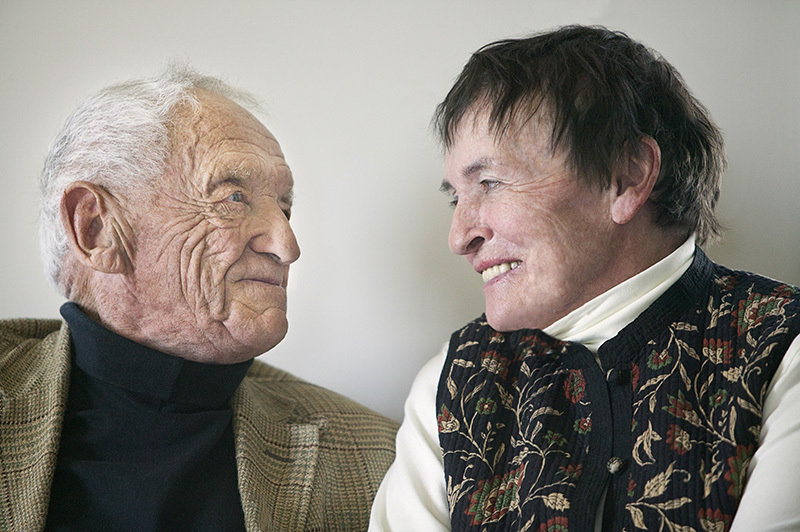 The museum has shown Wyeth every year since, and in 1998 opened the Wyeth Center to showcase three generations of Wyeths – Andrew, his father, and his son, Jamie – and added the Wyeth Study Center in 2002. 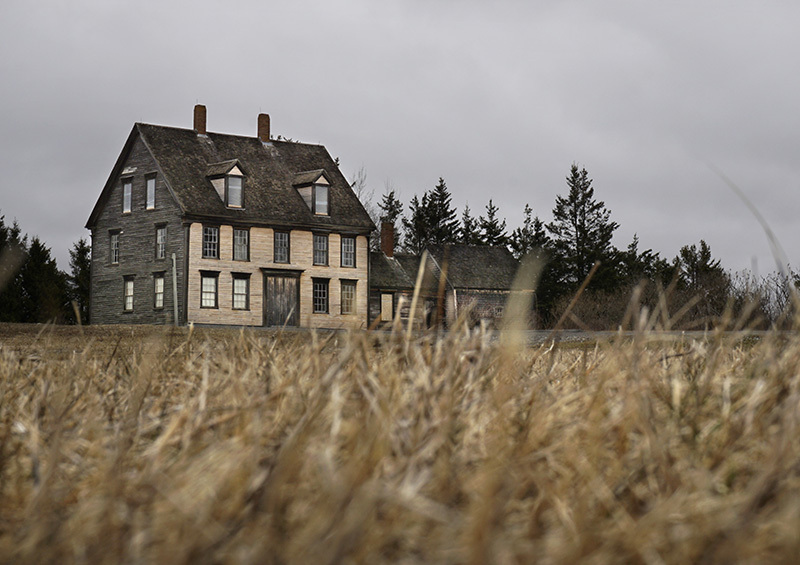 It also operates the Olson House in Cushing, where Wyeth made “Christina’s World” depicting a local woman crawling through tall grass in an open field, her stark family home in the near distance. The Olson House in Cushing. Wyeth painted it in 1948 when he was 31. The Museum of Modern Art in New York bought it soon after Wyeth finished it, and has shown it since. It remains one of America’s best-known paintings, and still draws huge crowds at the MoMA. Wyeth, who was born July 12, 1917, died in 2009 at age 91. He’s buried nearby, within eyeshot of the Olson House. 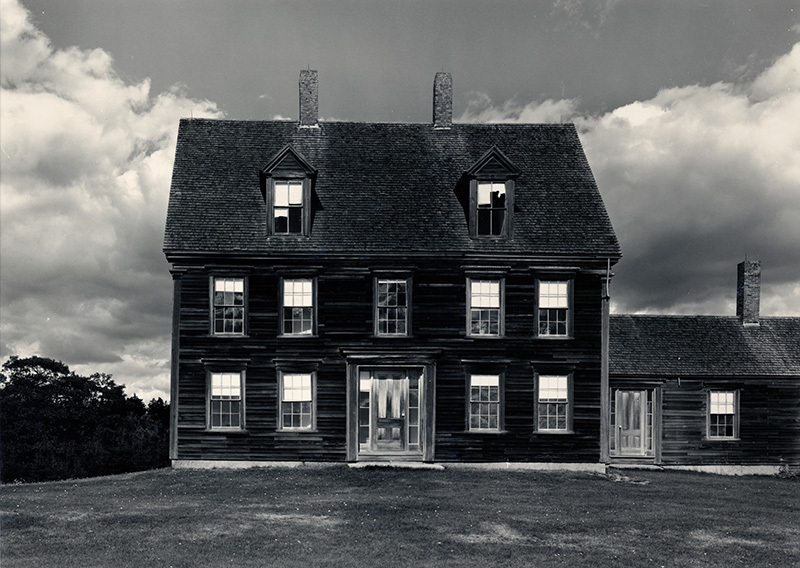 The Olson House has captivated photographers since Wyeth made the painting and is the subject of “The Olson House: Photographers’ Muse,” opening Saturday at the Farnsworth with images of the isolated house and its pastoral surroundings taken by photographers for more than 50 years. It includes photos by Paul Caponigro, Tillman Crane, Kosti Ruohomaa, George Tice and others. 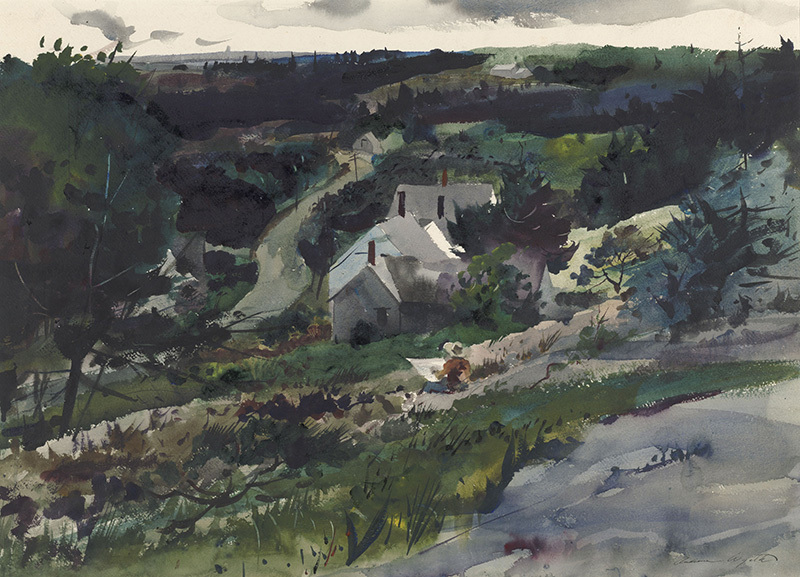 The Farnsworth organizes its five shows around the theme “Andrew Wyeth at 100.” The largest of the five, “Maine Watercolors: 1938-2008,” also opens Saturday. Although Wyeth was best known for his tempera paintings like “Christina’s World,” Michael Komanecky, chief curator of the Farnsworth, believes he did his best work with watercolors. 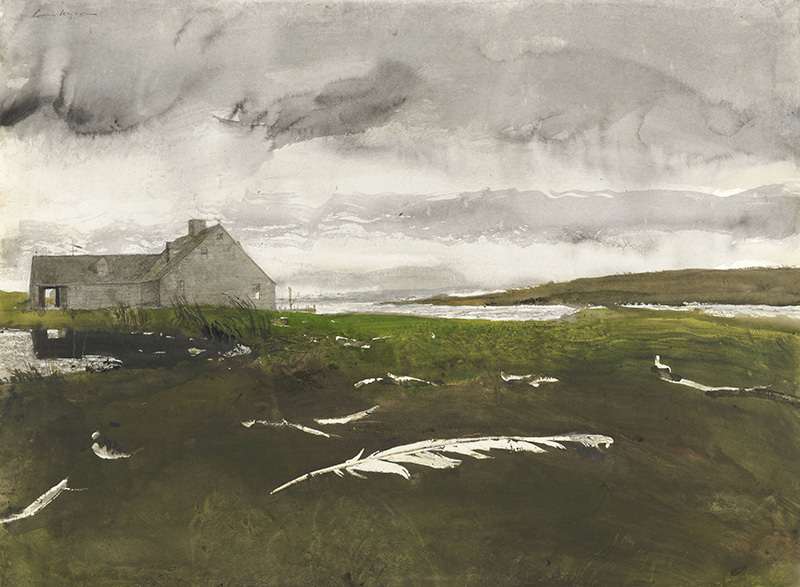 This exhibition attempts to make that case by documenting Wyeth’s progression with watercolors and dry brush, another water-based medium he favored, over 70 years and 40 paintings, tracing changes in technique and palette. “Maine Drawings” and “Dr. 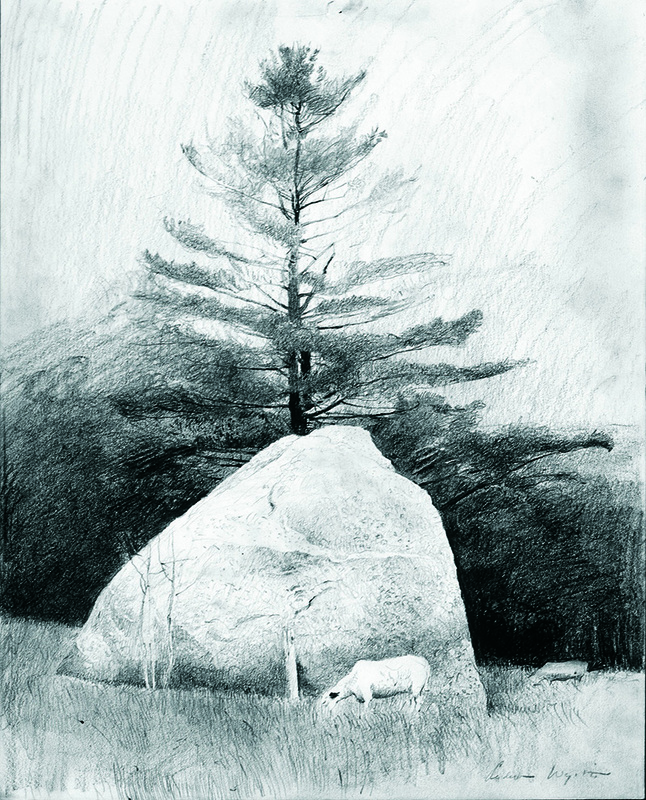 Syn” are both on view now, with the drawing show focused on an often-overlooked aspect of Wyeth’s process, and “Dr. 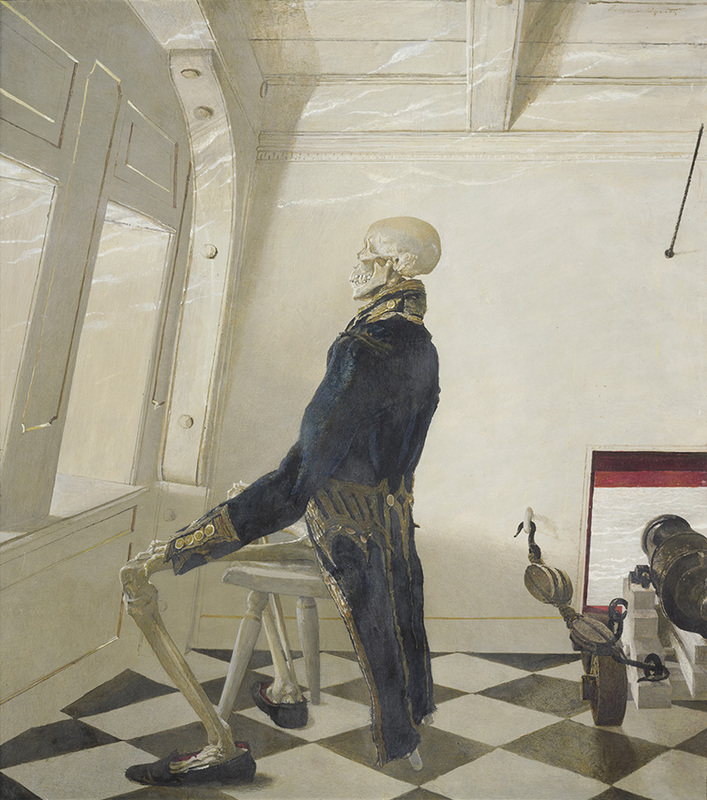 Syn” taking a concentrated look at a single painting – an odd, eerie 1981 self-portrait showing Wyeth as a skeleton dressed in a military coat, gazing out a window. The exhibition includes numerous studies and drawings that Wyeth made leading to the final painting, as well as the military coat. Both “Dr. Syn” and the drawing show demonstrate Wyeth’s working processes and his methods of exploration, Komanecky said. The last of the five exhibitions, opening in the fall, will feature the painting “Her Room” and the preparatory work associated with it. In June, the Brandywine River Museum of Art in Chadds Ford, Pennsylvania, opens “Andrew Wyeth: In Retrospect” with 100 paintings, organized chronologically with sub-themes that focus on his portraits, his dedication to the Maine and Pennsylvania landscapes, and his exploration of erotica. It also examines how his paintings changed after the death of his father in 1945, and his reflective later years. The exhibition will travel to Seattle in the fall. Wilmerding, who served on a Wyeth foundation board and knew the artist for 50 years, said exhibitions that attempt to probe beneath the surface of Wyeth’s paintings will continue to reveal more about the man and his art. With Wyeth, the paintings were rarely as they appeared, Wilmerding said. Rockport photographer Peter Ralston grew up along the Brandywine River in Chadds Ford. 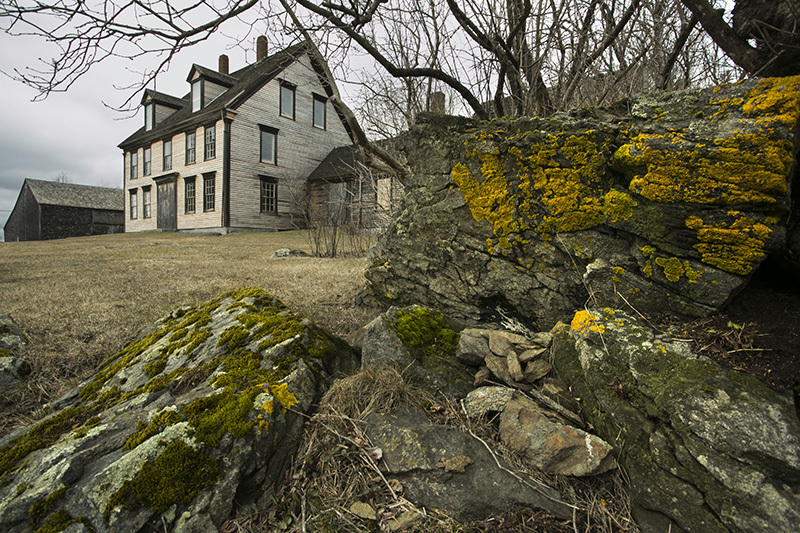 In 1958, when Ralston was 8, Andrew and Betsy Wyeth bought an 18th century mill building next door. At that point in his career, Wyeth was a star. He painted “Christina’s World” a decade earlier, in 1948. 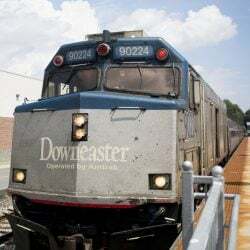 After quitting school and moving out of his parents’ house in the 1960s “with a Pentax and a couple of lenses,” Ralston worked as a freelance journalist and commercial photographer for a few years before moving back to Chadds Ford, where he found his own home down the road from his parents and the Wyeths. In 1978, the Wyeths enticed Ralston to move to Maine, ostensibly for the summer, but it became a year-round commitment in short order. Betsy Wyeth, who is now 95, had begun acquiring islands off Port Clyde, with the intent of rehabilitating habitat and dilapidated structures, and creating permanent wharves and trap storage for local lobstermen. She enlisted Ralston for his physical labor and his vision. In 1983, Ralston co-founded the Island Institute in Rockland, which works to sustain island and coastal communities, and began publishing the Island Journal, creating a platform for his photography. Wyeth, who once said “I paint my life,” lived his life exactly as he wanted, Ralston said – sometimes to the detriment of his reputation, but always with his art and family first. 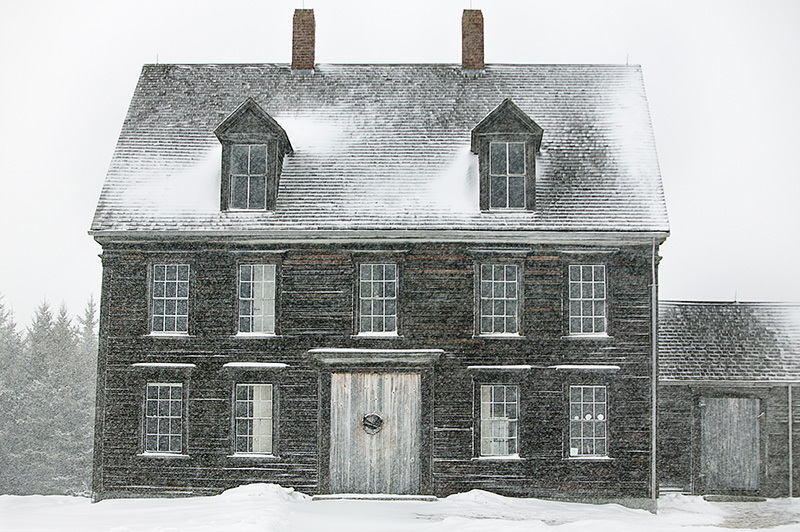 The Olson House, where Wyeth made “Christina’s World,” was high on the list – a cultural landmark and the setting for one of the most famous paintings in America. It did not disappoint, rising from the surrounding fields with its gabled roof, twin chimneys and inherent mystery. “Christina’s World”: At 31, Wyeth immortalized Christina Olson in this 1948 painting, one of America’s best-known pieces of art. It still draws huge crowds to the Museum of Modern Art, which bought the painting soon after it was finished. It made an impression on the young girl, and the memory of the Olson House stayed with her. The actual painting resonated for other reasons. It shows Christina Olson as a young woman, crawling through the field, pulling herself toward the house. Her physical ailments are implied by her heroic effort. Baker Kline got the idea for the book from a friend who saw “Christina’s World” at the Museum of Modern Art, and thought of Baker Kline. The painting, made with tempera paint on panel, is larger than life, she said. Most people are familiar with it, and many people have their own ideas about what’s going on in the painting. It was a perfect starting point for her novel, she said. 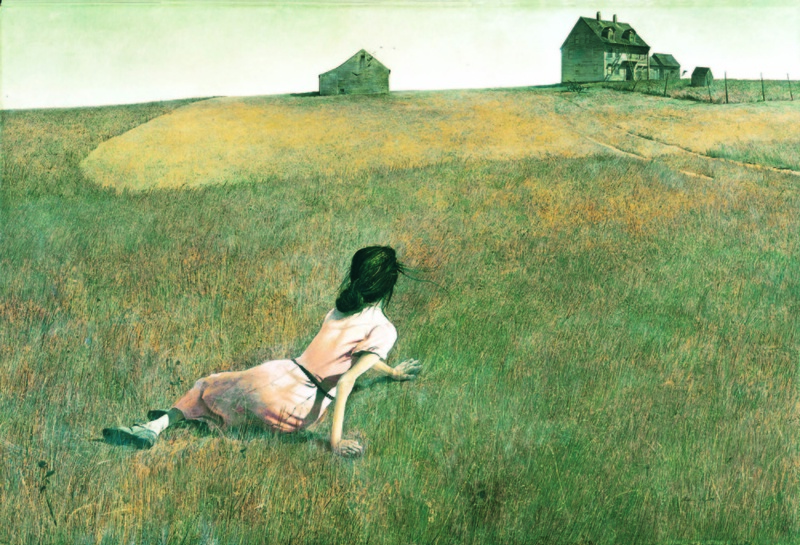 She learned about what University of Kansas art scholar David Cateforis calls “the Wyeth curse” – the disdain of art critics, who chastised Wyeth for what they saw as romantic, surface-level views of the rural landscape. Cateforis is among those attempting to change that perception. 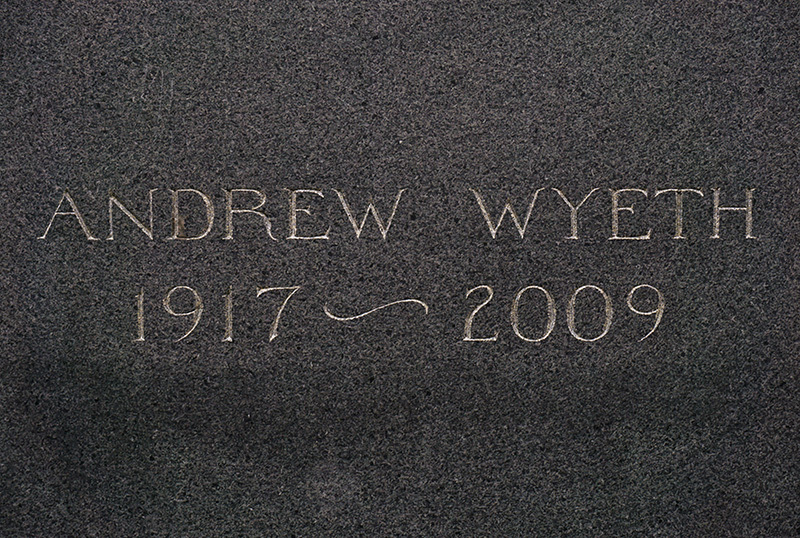 He edited the 2014 book “Rethinking Andrew Wyeth,” which reconciles the opposing images of Wyeth with a series of essays by mostly young art historians, who tend to look at Wyeth with more open minds than their older counterparts. 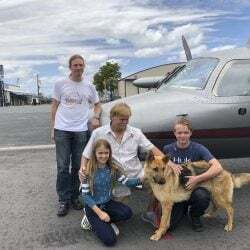 Despite that opinion, there has been resurgent respect in the past decade, as often happens after an artist dies and critics reflect on a lifetime of work, Cateforis said. 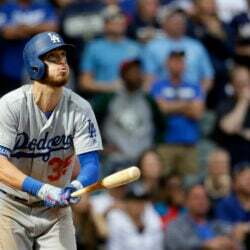 But the curse remains. Ralston visited the Olson House soon after Wyeth was buried, in January 2009. It was snowing, and he knew no one would be there. He wanted a few minutes alone with Wyeth. Ralston took a few photos of the Olson House, its roof covered with drifting snow. In memoriam, someone placed a black ribbon on the front door. 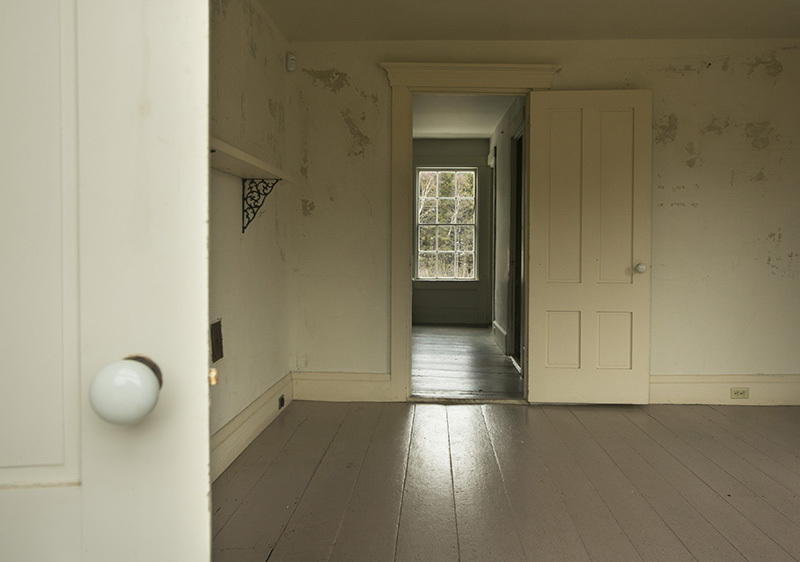 Ralston sees his image of the house as a portrait of Wyeth. The artist is gone, but the old house stands in for him, still strong and solid against the elements.